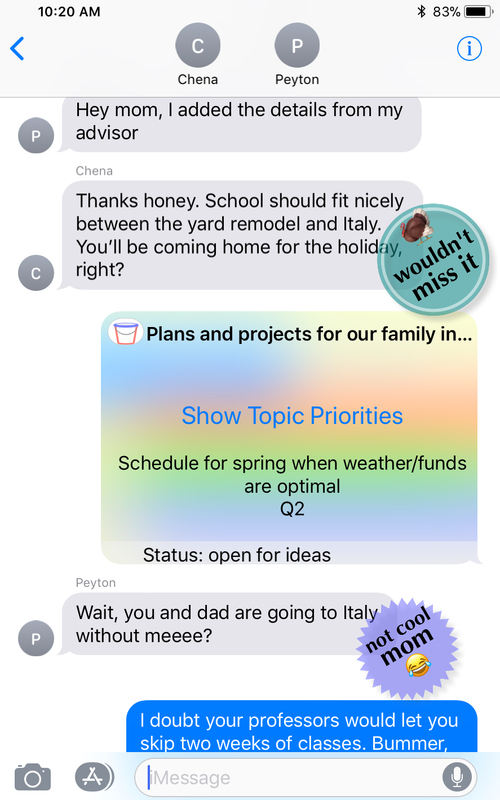 We appreciate your interest in Wicked Buckets, a breakthrough in collaborative planning that is fully integrated with Apple's iMessages platform. This guide will identify the key parts of the app and point out special features that are certain to be of interest to users. Please contact us at pr@wickedplan.cloud if you have any questions. 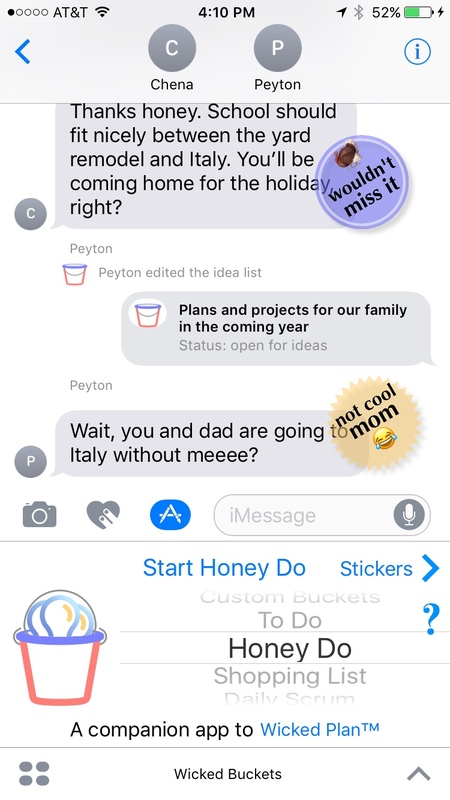 Wicked Buckets is an iMessage app. It works within Apple's Messages app and is available through the iMessage App Store. The goal of planning is to know where you're headed and the steps you're taking to get there. Collaborative planning changes "you" to "we," so that we know the steps we are taking. iMessage is a natural place to do collaborative planning because we're already texting with the participants. The challenge with iMessage (and other messaging apps) is that the items and dates and details of what we're planning are spread all over and mixed in with all the other conversations we're having with those people. The buckets topic expands from iMessage to show all the data in one place rather than spread amongst unrelated texts. notifies everyone of the changes to the plans. The result is that with Wicked Buckets, your group can add items and data at any time and from anywhere. It's more interactive and collaborative than email, more productive than meetings, and more convenient than logging into a separate service. A family needed to relocate for a new job. They had to close up things at their current residence, arrange the move, complete activities such as finding a new residence, registering at a new school, switch accounts and such from one state to another, etc. And at various times the members of the family would be at different places, so keeping their actions and progress coordinated was important to a smooth move. The family used Wicked Buckets, with custom buckets for activities in the first city, activities in the second city, packing & moving, and job switching. With the whole family texting each other regularly anyway, keeping the plan up to date in Wicked Buckets was a natural way to stay current on the move over the two months it took from start to finish. The second use case is a work team that had an hour to prepare a SWOT analysis as part of a marketing plan. The team was spread over various offices more than one hundred miles apart. Instead of driving or having a conference call, the team used the Wicked Buckets SWOT template and had a fast-paced collaborative session. All team members added to the SWOT, with other members seeing the additions live and able to react to them with edits or their own new ideas. They finished in fifteen minutes with dozens of captured ideas, and then used iOS 11's drag and drop to drag the top ideas into a custom Wicked Plan canvas showing the SWOT as a one-page diagram. If you're working with someone – family, friend, co-worker – and it relates to future activities – a honey-do list, family grocery list, travel plans, work project – Wicked Buckets could be the best and easiest way to plan with them. And it's equally effective for those things you plan individually, too. For many activities, a pre-built template will be the easiest way to start a plan. Perhaps a husband and wife will share a honey-do list, or will collaboratively plan a family vacation. Roommates may have a shared grocery list. Co-workers may need to build a SWOT analysis. There are templates for those and more. Alternately, a custom bucket list can be built for anything else. In the example shown, a family is currently planning a trip to Italy, a backyard remodel, a child's move to college, and a family reunion. All of these are activities where every family member can contribute and benefits from being aware of what's going on. Anyone can add items. Tap the left margin of the bucket (category) in which to add the item, type it or dictate it, and press the return key to add it. Tap the Send to group button to share it with the group. If they're looking at the same bucket list, it will update live. Otherwise they'll receive a notification of the change. Changes can be shared with the group whenever each person desires, allowing a person to make several additions and then work on the wording before finally sharing. Beyond the description of each item, there's allowance for additional data including notes, dates, and amounts. This allows for further explanation of details, and display of schedules and budgets. Columns can be shown or hidden at the users discretion, with a convenient display indicating if there's any data in that column or not. Note that the date column is self-configuring. It adapts automatically to the data present, so that the user sees just the relevant date range at the optimal scale. Items can be removed from the plan as easily as they can be added, though this is a privilege reserved for the topic's creator. Tap to open the Extras menu, tap the Pause button, and delete or rearrange rows using the standard controls. Tap the Play button to resume editing. As one example, a SWOT analysis, which is a popular business tool, has a traditional display that's a 2 x 2 matrix with labels. To see that diagram in Wicked Buckets, tap the Extras button and then tap the Canvas button. As another example, the family grocery list can be displayed as a convenient one-page diagram. This view of the data can be shared as text or a PDF. One of iOS 11's slickest features is drag and drop. Here's how it works in Wicked Buckets. Imagine preparing a plan and then wanting to share some of it into a Wicked Plan document or to another app such as Pages or Notes. Set up a split screen display on an iPad, with Messages and Wicked Buckets on the left and the desired Wicked Plan document on the right. Press on the left margin of an item in Wicked Buckets and wait for it to "lift." While still pressing it, tap on other items to add them to the dragged collection. Then drag this to the Wicked Plan side of the screen and drop it into the outline wherever it makes sense. Guidelines will display to assist you. That's it. The items are added to the Wicked Plan outline as new rows. You can also drag into appropriate areas of a Wicked Plan canvas. An item can be prioritized by swiping the checkbox to the left. The choices that slide out are Normal, Medium, High, and Nag. Medium and High display a yellow and red circle (think stoplight) respectively beneath the check box and those items are listed in the Live Layout in Messages. Nag displays a gray circle and will display as an animated marquee in the Live Layout in Messages. That means you can see prioritized items without even launching the app, and it's automatically updated as other group members edit the topic. 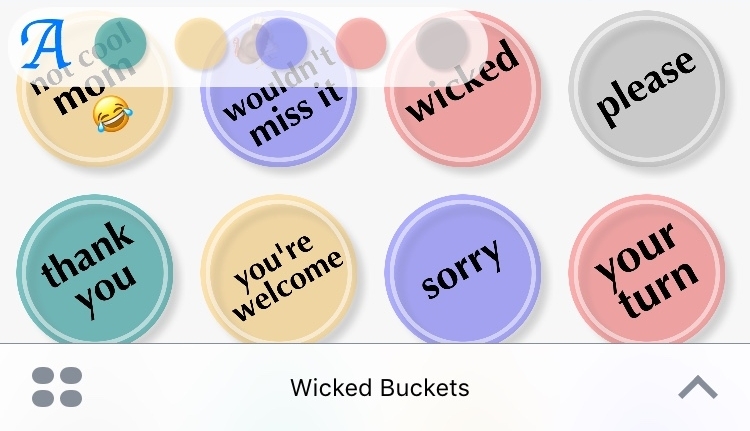 Wicked Buckets comes with dozens of stickers perfect for communicating with family, friends, and coworkers. You can change their font and color, too. And it also lets you use any of the custom stickers you created with Wicked Custom Stickers.